During this talk, Mohammed Laouli presents his long-term project Ex-voto. An ex-voto is an offering made to a deity, to ask for grace or express gratitude for a blessing. Ex-voto is also the title of the latest project of Mohammed Laouli, through which the artist confronts the violence of colonial history to a soft, and yet sharp “thank you”. 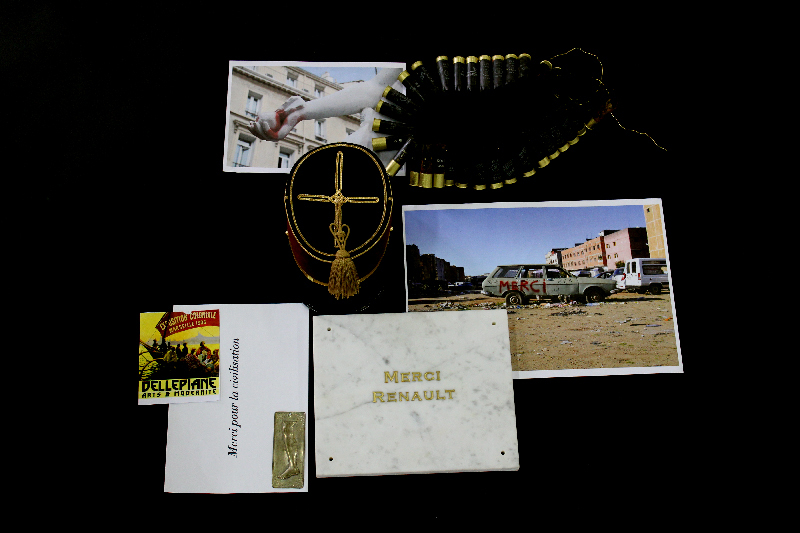 Parts of the artistic pieces Mohammed Laouli developed for his “Ex-Voto” project are showcased in his solo exhibition at Le Cube, Power Dance. This event is part of travelling narratives, a regional program of art and research that aims at encouraging interactions between cultural agents in Morocco, Algeria, Egypt, Mauritania and Libya. Through the organization of a cycle of residencies, exhibitions, screenings, meetings, workshops and conferences, this project strives to cross and connect micro-stories from North Africa in order to discover and disseminate endogenous stories of these territories and to collectively imagine new social and cultural utopias from these alternative narratives. Travelling narratives is supported by AFAC – The Arab Fund for Arts and Culture, the Goethe-Institut Marokko, the Institut Français du Maroc, the Centre Jacques Berque and the Ministry of Culture and Communication in Morocco. The program is carried out in partnership with Townhouse, مؤسسة ورق للفنون – WaraQ art foundation and the cultural space Diadie Tabara Camara.